Build a new parser of this type and return a pointer to it. 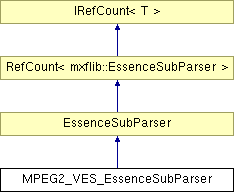 Read the sequence header at the specified position in an MPEG2 file to build an essence descriptor. Scan the essence to calculate how many bytes to transfer for the given edit unit count. Get a byte from the current stream. The native edit rate of this essence. Selected edit rate of this essence. Ratio of selected to native edit rate. Picture number of last "anchor frame". The size of the next data to be read, or (size_t)-1 if not known. The number of wrapping units that CachedDataSize relates to. Current position in the input file. The stream position of this picture in the GOP. True if the current GOP is flagged as closed. Buffer for efficient file reading. Count of bytes still unread in Buffer. Pointer to next byte to read from Buffer. Set true each time an edit point (sequence header of a closed GOP) and false for other frames. True if each index entry is stored and only added to index by a call to SetOption("AddIndexEntry");. True once the end of the stream has been read. Pointer to the last essence descriptor we built. Class that handles parsing of MPEG-2 video elementary streams. Valid MPEG2-VES files with > 510 extra zeroes before the first start code will not be identifed! This flag can be checked by calling SetOption("EditPoint") which will return the flag. The flag tells only if the last frame is the start of a new sequence.